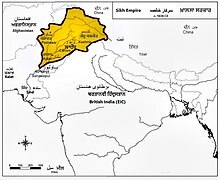 Punjab (/pʌnˈdʒɑːb/ ( listen)) is a state in northern India. 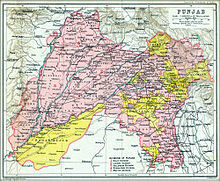 Forming part of the larger Punjab region of the Indian subcontinent, the state is bordered by the Indian states of Jammu and Kashmir to the north, Himachal Pradesh to the east, Haryana to the south and southeast, Rajasthan to the southwest, and the Pakistani province of Punjab to the west. The state covers an area of 50,362 square kilometres, 1.53% of India's total geographical area. 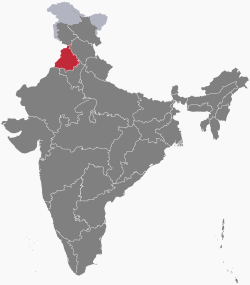 It is the 20th-largest Indian state by area. With 27,704,236 inhabitants at the 2011 census, Punjab is the 16th-largest state by population, comprising 22 districts. 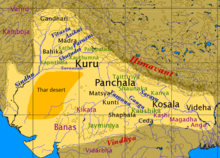 Punjabi is the most widely spoken and official language of the state. The main ethnic group are the Punjabis, with Sikhs (58%) forming the demographic majority and Hindus (38%) forming a sizable minority. 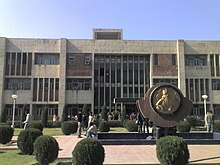 The state capital is Chandigarh, a Union Territory and also the capital of the neighbouring state of Haryana. The five rivers from which the region took its name were Sutlej, Ravi, Beas, Chenab and Jhelum; Sutlej, Ravi and Beas are part of the Indian Punjab. The main players in the politics of the state are the Indian National Congress and the Aam Aadmi Party who defeated Shiromani Akali Dal (with alliance Bharatiya Janata Party) and gained position of First Time Opposition in Punjab. The present government is headed by Amarinder Singh. President's rule has been imposed in Punjab 8 times so far, since 1950, for different reasons. In terms of the absolute number of days, Punjab was under President's rule for 3510 days, which is about 10 years. Much of this was in the 80s during the height of militancy in Punjab. Punjab was under President's rule for 5 continuous years from 1987 to 1992. Each district under the administrative control of a District Collector. The districts are subdivided into 82 tehsils, which have fiscal and administrative powers over settlements within their borders, including maintenance of local land records comes under the administrative control of a Tehsildar. Each Tehsil consists of blocks which are total 143 in number. The blocks consist of revenue villages. There are total number of revenue villages in the state is 12,278. There are 22 Zila Parishads, 136 Municipal Committees and 22 Improvement Trusts looking after 143 towns and 14 cities of Punjab. Majitha is newly created tehsil, which was formed in September 2016. Zirakpur is the latest sub-tehsil, in the district of Mohali. According to the India State Hunger Index, Punjab has the lowest level of hunger in India because of it's great agriculture. Statue of Punjabi Bhangra dancers. Bhangra is an integral part of Punjabi culture. Yellow footed pigeon at the Nature Park in Mohali. ^ "BNYS ONLINE". www.bnys.online. Retrieved 2018-01-10.